If I'm completely honest, I was pretty disappointed when I found out my master's was only offered as a distance learning course. I was all excited about getting back on campus and living uni life but unfortunately I just had to go along with it. To my surprise, I love it! Sure there are downsides but the flexibility is hard to beat. 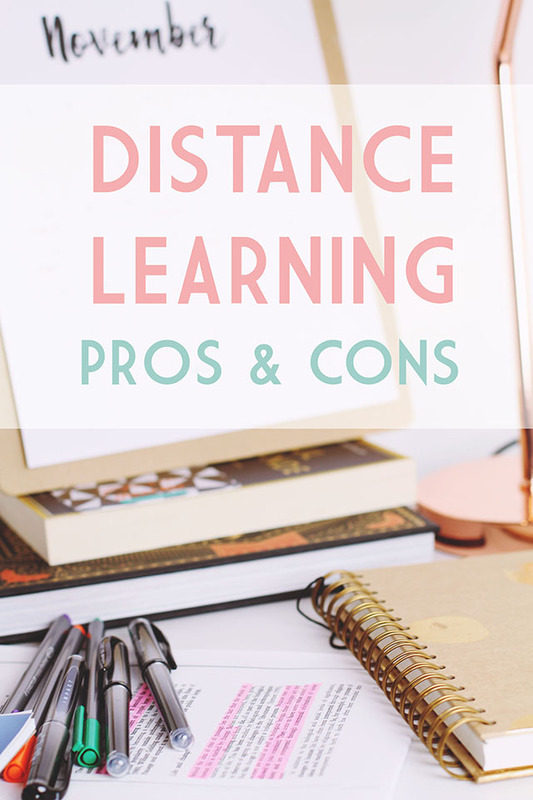 If you're wondering whether distance learning will work for you, take a look at my list of pros and cons. Because I'm not travelling to and from campus every day, my course has minimal expenses. I buy the odd textbook and of course I'm using more electricity than if I were out of the house all day but it's definitely keeping costs down. The flip side of this is that I can go days on end without actually leaving the house but it certainly beats shelling out for a train ticket five days a week. On my course, there is only one person who has come straight from university. All the rest of us have spent time working since we graduated. This means you're probably going to be settled, maybe with a family, and unlikely to be able to just up sticks and move to be near the perfect university. With distance learning, that doesn't matter. You can choose any course, anywhere in the world and it won't be an issue. We have someone in our cohort who lives in Estonia! The world is your oyster! OK, I'm not exactly a social creature so this doesn't particularly bother me but it is a shame sometimes that I don't have a friend to bounce ideas off. I have had contact with fellow students to double check their understanding of assignments but it's not the same as forming a bond and having a chat over coffee. My university has just started using a new online conferencing system which allows students to chat before the lecturer arrives so that's nice. The biggest issue for me here is that I don't communicate very well on voice alone. There's something about losing all the non-verbal cues that completely throws me off and makes me all tongue-tied. When I'm already struggling with a tricky concept, it's horrible to find myself in lectures where I can't communicate my thoughts eloquently. Thankfully I live fairly near my university so when I have one-to-one tutorials, I arrange to meet my lecturers in person but it's definitely more difficult not having opportunities to informally ask questions in a classroom setting. When I studied my undergrad, I was told to limit the amount of books I use in essays and concentrate on journals instead, since books quickly become outdated. Because of this, it's not really much of an issue being nowhere near a library. Of course I have full access to the university's electronic database of journal articles so it's never a problem finding relevant texts. However, sometimes I do need a specific book, especially when I'm writing about key texts in the field, and Google Books/ Amazon previews only get me so far. I have taken a book out of the library because I happened to be on campus but it's not practical for me to keep making trips up and down the M3 just for the sake of a couple of books. Instead, I'm having to buy them myself. Although this is added expense that I wouldn't have living nearby, it is helpful to have books lying around for reference whenever I need them. No lecturers lingering over my shoulder means no accountability. Sure, I need to have some thoughts ready to discuss in my lectures but, to be honest, I could just skim over the readings and make some stuff up. There's also the fact that my lectures don't actually teach me anything, instead they're purely to clarify uncertainties from the tasks and share our thoughts. It's completely up to me to make sure I do all the readings, carry out research and generally make sure I know what's going on. If I didn't do this, I'd have no idea when it came to essay time. For someone with such a long history of procrastination, I'm amazed at how disciplined I've been. It's probably because I have no other option! Despite my concerns, I've been very pleasantly surprised by distance learning. When I'm sitting in my PJs, listening to the radio while studying and generally loving life, it's hard to imagine why I wanted to travel in all weathers to reach campus!